Magic guard Victor Oldadipo takes a shot against Pacers forward Paul George. INDIANAPOLIS (AP) — CJ Miles and Glen Robinson III each scored 14 points to lead the Indiana Pacers to a 97-92 preseason victory over the Orlando Magic on Thursday night. The Pacers had five players score in double figures and rallied from a 15-point deficit. 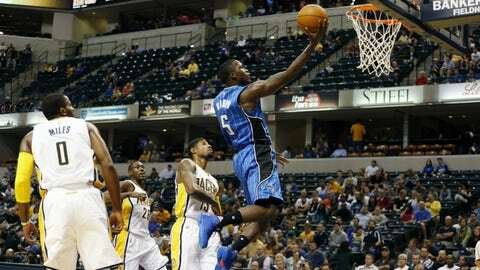 Victor Oladipo led Orlando with 15 points. MAGIC: Tobias Harris had 12 points and 13 rebounds. Nikola Vucevic added 13 points and nine rebounds. PACERS: Indiana may not miss Roy Hibbert’s presence on defense this season with Ian Mahinmi and rookie Myles Turner defending the rim. Mahinmi had three blocked shots Thursday night and Turned added two. Jordan Hill came off the bench alongside Turner and added three blocks. STAR WATCH: Paul George scored 13 points and grabbed seven rebounds in 26 minutes. George is inching closer to the level of play that made him a two-time NBA All-Star before he broke his leg during a USA basketball scrimmage in Las Vegas in 2014. RIGHT AT HOME: Oladipo, a former Indiana University star, felt right at home and shot 50 percent from the floor and 50 percent from beyond the arc. UP NEXT: Orlando meets Houston in Hidalgo, Texas on Sunday. Indiana hosts Detroit on Tuesday.